When I was but a wee lad, one of my dad's many job transfers took us to Chattanooga, Tennessee. It was a beautiful place, although apparently Canucks talk funny, according to the locals. And while we lived there, we discovered that Southern hospitality in Chattanooga is alive and well. We also learned various slang expressions, and folklore wisdom of the Southerners (although our immediate neighbours were an Italian family from New Yawk and had the accents to prove it), but I can't honestly remember if I first heard about crab-in-a-bucket behaviour while I was there or not. It's a fairly well-known story that you can put one crab in a bucket, and it can easily escape. 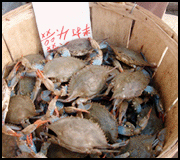 But if you put several crabs -- even a LOT of crabs -- within easy reach of the rim, they'll never get out. If a crab attempts to escape, the others simply reach up and pull them back down. This picture reminds me of a potential trap to be found when people go through detoxing from church in a group setting. Sometimes, people who are in detox join an existing house or simple church, and find safety and healing. Also common is when "a whole whack of" people (another colloquilism apparently peculiar to Canada, or so friends in California tell me) who are ALL in detox start their own group. And that's where crab mentality can show up. These groups start off as a place of safety and nurture, as people feel free to share their stories and be heard and understood by others who have been through the same thing (often from the same church). But as time goes on, when you'd expect to see at least some of the people starting to come back to life again, there instead seems to be a perpetual commitment to staying angry, bitter, and cynical. As soon as one person starts to show signs of returning spiritual and emotional health, and ventures to share this with the group, they are immediately pulled back into the vortex of cynicism by their crabbishly-endowed group. It's REVENGE OF THE CRABS, with their patron saint Mordac the Preventer. Sadly, I've seen some situations where those who were -- for lack of a better phrase -- "coming back to life" actually felt they had no other recourse but to leave the group behind, in order to escape the Crabbites. This tended to produce a second, albeit much milder and shorter-lived, period of detoxing from the disillusionment of what they'd originally hoped for in the home group. We all talk about "journey" -- and even the original byline of this blog was "robbymac: an ecclesiastical anarchist's journey" -- but we need to respect where others are at in their journey as much as we'd like them to respect our journey. And that has to include allowing people to come to terms with how they will relate to the larger Body of Christ around them, without imposing some kind of uniformity enforced by cynicism. Some people may stay in house churches for the rest of their lives. Others may return to a more "institutional" setting, perhaps even -- *GASP* -- the same church they left. Does that make them a "sell-out"? A quitter? No longer considered part of the Enlightened Remnant? And finally, have you ever seen a happy crab? One capable of being extremely jaded and simultaneously Christ-like? If you have, please adjust your medication let me know. Very wise words. In our current situation, I am watching the developments with a cautious eye. As such a large group of people suddenly find themselves displaced from their church, most of them aren't even aware of the detox they will experience. In reaction to leaving the church most have simply switched their Sunday morning attendance. I believe that the church where everyone has landed is likely a transitional place for many of them. Although, there will be a percentage that eventually plug in and make this church their home. I'm actually more concerned with the ones that are pursuing house church. However I haven't sensed in them the desire to dwell in bitterness. It remains to be seen whether they will learn to be outward focused. It seems that most are simply excited to test their wings after being freed from the control they were under. While I think the group will always be relationally connected, I believe that in the long-run, they will be dispersed in different expressions of church and that, in the end, that will be a good thing. Can you 'detox' while still being in the church you are detoxing from? In a possibly (but not necessarily) related question... In preparation for a move, can God be directing you elsewhere and therefore start 'deprograming' you from where you are to where you are going (maybe even before you know it)? I've heard many stories of (faithful, committed, love-the-local-church, always on time, serve or lead in a dept.) individuals who found themselves ineffective & frustrated for a period of time before they found out that God simply had other plans for them. Oops, I forgot to add this observation... often times there are "crabs" (or non-crabs) in one's home church that pull at you to stay in or return to that group (whether due to jealousy or their own genuine concern for your spiritual well-being). another question: Do we need to go back? Natasha and I removed ourselves from "going to church" for a long time, and tried to really be church with our friends more and more - without any defined structure, just trying to watch out for each other, praying, teaching etc. Anyway, I was thinking in the shower yesterday that I often feel discouraged when I talk to churching people because they give me reasons for being part of the big "go to church" crowd, but the past few years I don't find those reasons to hold true for me (they seem to work for other people). There's either something wrong with me, or it. Who cares which one it is at this point. The big question is do we have to go back? I mean, unless God tells us to go back, is there a reason? 1. Can you detox while still in the setting you're detoxing from? I wouldn't see why not, although it might be a bit more complicated and longer-lasting process. Do you have any friends in that setting to walk this through with? For me, "detoxing from church" isn't about abandoning church, but rather recognizing and getting out of false expectations of the church and also false expectations put on us by and in the church. So, yeah, I don't see why you couldn't do it where you are. It's just that most people I've met have generally found it necessary to completely disengage -- at least for a season -- in order to get the system out of their system. 2. Could the sense of frustration simply be God getting them ready for a move? (I hope my paraphrase of your question is consistent with your intent.) I've heard that referred to as God "stirring the nest" like an eagle does in order to make it easier for the eaglets to leave home. It's an equally plausible explanation for any sense of unrest and frustration that people may feel in their current situation. What sets "stirring the nest" apart from "detoxing from church" is that a stirred nest isn't necessarily an unhealthy paradigm of ministry -- it's just time to move on because God is setting you up for whatever's next. Detoxing from church has more to do with seeing previous leadership/ministry paradigms in a new way, and weeding out the unhelpful from the helpful. It's also equally possible to have both dynamics (stirring & detoxing) happening at the same time! You'd have to be listening closely to God to hear what He's trying to say to you (assuming your questions aren't hypothetical, that is). This is true in deciding to leave, move on, or resisting (if necessary) the pull of people to come back. Unless God tells you, of course. I think (to be charitable) most people are genuinely concerned with us not becoming Lone Rangers in our faith walk. And I think the Bible completely supports and encourages us to be in regular "hangin-out-ship" with other Christians, for mutual support, encouragement, teaching, etc. When I first came back to Winnipeg in '97, you and I were attending the same church for awhile, but my main "fellowship" was with the Dead Pastor Society which met religiously at the King's Head Pub in the Exchange District every Monday night for years. At this point, I find myself equally comfortable hanging out with ecclesiastical anarchists like Len Hjalmarson & his crew of radical reconstructionists over coffee/brews, and also spending time with the leaders of a fairly large charismatic church in town where we attend, as they (the leaders) are wrestling through the issues of permission-giving leadership paradigms and possible destructuring of the church. I guess I just see the Kingdom as large enough to encompass both, and I'm willing to swim in both streams and connect with whoever connects with us. It all gets back to hearing the voice of God for ourselves, and then working out our salvation with fear and trembling in whatever context God appears to be leading us into. Keep us posted, and please say hi to Natasha for Wendy & I! If you ever make it out here, you know you have a place to crash. I was pretty much going to pose the same question as KSG, but since he already did, here’s my follow-up comments and thoughts to ponder. I often struggle with detox vs. disengagement. Am I really feeling the detox coming on, or have I become just disinterested in engaging to meet the “false expectations” that come with attending (or listening to the “plastic squirrels” from the pulpit)? Or, gasp, have I just become comfortable and casually cynical to the whole church environment and need a detox from the detox to just be at one with Him for a season? With a partner that is fully engaged, both at a spiritually level and an “involvement in ministry” level, I sometimes fear I have become the tag-along for support at the cost of my inability to want to get involved. The plastic pastor’s wife without being a pastor’s wife! At the root, when you really need to detox but also really need to stay in order to encourage your partner, is it better to really disengage or find another outlet to engage in at the church? I just can’t see God wanting to (metaphorically) split us up across how we (as a couple and family) stay connected with Him, even if the journey is for a short season. But hey, if I’m the only crab in the bucket this should be a pretty short trip out! I left an abusive church about twenty years ago, and for a long time my former church friends avoided me like the plague (and I was a teacher and elder no less). Then, several months later, one of them showed up at my apartment to chat. We got along swell—up to a point—and then there seemed to be a wall between us. I just couldn't understand what the difficulty was. After all, if she had "separated" herself as I had, we should be on the same page, shouldn't we? Then afterward the Lord spoke to me about the phrase "Come out and be separate." It's not a parallelism, it's a two-part command. Revelation of what's wrong precedes separation from what's wrong. But doing what's right is another step entirely. If you never take that second step, you can not only languish in your difficulties but actually duplicate the very behavior that once alienated you (i.e., do to others as others did unto you). Revelation never cleansed anyone; only the blood of Jesus cleanses and then sanctifies us. Regarding question #2: For the last 1.5 to 2.5 years there has been a progressive disconnect with our church family, although we were happily serving until 3 months ago when we approached church leadership regarding what was in our heart regarding our future, at that point we were removed from our areas of service (we have no issues with this although we would prefer to serve until we move). In not serving there has been an accelerated disconnect due in large part to service being where most of our church’s one on one fellowship is centered – the church primarily views fellowship as being the “fellowship of the Word” (read: preaching/teaching ala Wed/Sat/Sun meetings). 2.) In incident (summer 05) involving church leadership and my bro & sis in-law. (Without taking a lot of time to explain the belief systems of our church I’ll just say…) The super condensed version is… bro & sis volunteered 18 + yrs in kids dept. and were paid staff for 3 yrs at church’s inner city kids outreach. Bro heard from God about moving to BC so he handed in his resignation, church leaders said, “no, you didn’t (hear from God)”, bro said “yes we did”. That meant bro was not submitting to authority and so the leaders dismissed them from church (without paying last week of wages), and the church body cut off all relationship with them. (This incident is just one in a long series of such incidents involving many other people over the last 15 yrs, and the only common denominator is the “set man” at the top.) We were sat down and asked to choose between believing the pastor who we’ve never had a relationship with [I can explain later if needed] or our bro & sis who we know as both physical and spiritual family. When I cried out to God about it he just gave me Matt 23:1-3, which was sufficient for that moment. This incident forced me to take a hard look at both the letter and the spirit of the Bible to see what scriptural authority & leadership means (hence my finding your post charismatic article and many other documents) and to seek Him regarding our future since it is unacceptable to remain where we are, and remaining in our city but quitting our church won’t fly (I can cite numerous examples of what happens to people who do that, but for a good read that could have been written by some guy sitting down the pew from us read “Breaking Christian Curses” by Dennis Cramer). So in summary, we are both stirring & detoxing (yeah, what fun!) but we seriously desire to get the ‘stirring’ (and therefore moving) part over with, so we can get on with (and done) the detoxing. We just want to be where we’re supposed to be, so that we can do what we’re supposed to do. OH MAN, Robby, HOW do you do it? Great post, again, and as usual. We moved far away. Almost all of those who got out and remained local tended to stay in perpetual crabdom. It was really strange to watch...like they just couldn't get away from the bitter root. I understand full well the bitterness that can come from being betrayed, but to stay in it, to live in it, to wallow in it? But sometimes I think it's all too easy...and I worry about that for myself, in my recent detoxing experiences from the conservative-ism I accepted as Christianity. I agree completely that you two need to be "together" on this one. I have seen numerous instances where one spouse refuses to go to church while the other gets even deeper in their involvement. It's never been healthy for the couple in the long run (or probably even the short run). Whether you need to detox from the detox or whatever, it's vitally important that it leads you to be, as you say, "one with Him". Is there an equivalent of a Dead Pastors' Society meeting at a pub nearby? Could you start one? Does anybody else here have some input on this? Yes, I've seen that phenomenon before: people leaving a church/house church because of (usually) controlling leadership, and then replicate identical controlling leaderships in their church plant or house group, with the only difference being that now they're in charge. That's the difference between "detoxing" and just running away from a bad situation. As Bob Girard told me once, we have to get the system out of our system! Yes, you certainly ARE experiencing "stirring of the nest" and "detox" at the same time! The situation with your in-laws and how the church dealt with them grieves me. And to hear that you were supposed to disassociate yourself from family who you knew had done no wrong is just, well... ludicrous at best, and cultish at worst. If you're feeling the "stirring", make your exit sooner than later, as much as you can. Sometimes (in our personal experience, which I don't assume is normative by any means), staying longer can result in people saying stupid things that they'd never ordinarily say, just because you're leaving. And those comments are almost always hurtful, and often results in making the "detox" a longer season than it would have been. Because then you're not just sorting out leadership/structure paradigms, you're also recovering from verbal thrashings that can really take a lot out of you. I have also seen the perpetual crabdom in some groups, and it's really sad because they're really decent people, but they've gotten caught in almost an addiction to bitterness. It's like they don't know how to interact with each other in any other way, and so they end up back at the default setting: bitterness crab. I hear what you're saying when it comes to uncovering and speaking about mistakes and abuses; I try to keep it on the level of belief and practice, and very, very rarely mention names. And guarding my own heart has to be a deliberatem ongoing choice when writing, as I'm sure you've discovered as well. Being a rebel = leaving the church and then telling others about the bad stuff that happened to you. Being a deserter or fugitive = leaving the church and keeping your mouth shut. Being an idiot (Pastor X’s quote, “Nobody ever accused them of being smart” yuk, yuk, yuk) = moving away for school, a job, etc. Being a misguided fool = moving away because you believe you are following God but the leaders can't give you their stamp of approval so you get “blessed out”. In my church, the higher up you get, the less likely you are to be blessed out. And even at that, we've been clearly instructed on what "blessing someone out" means... that leadership can't endorse their decision to move but we've all agreed to be nice about it. The only perk of this is the ability to come back to visit. Being a golden boy = moving way to expand the kingdom of XchurchX, oops, I mean the kingdom of God, because leadership has heard from God about where and when you are to be “sent out”. Their BIG thing is to be "sent" out, not to "went" (just go) out. Their other BIG thing is their claim that “leadership will hear from God first”. The challenge in leaving sooner rather than later is that my wife’s family all still serve the church. No biggie for her parents since they do not serve in any leadership capacities. But her brother and sister-in-law are worship leaders at the church’s satellite church in the inner city (where my bro worked). So obviously HOW we remove ourselves is fairly critical as we do not want to make things difficult for them. We had determined that our goal would be to take a little time and try to get “blessed out”, since being ‘sent’ seemed impossible. So we approached leadership, shared our hearts and listened to them say that they (and Pastor X) would pray about it. (Secretly we hoped to come to an agreement so we could be ‘blessed out’, thus making things easier for the in-laws.) Fortunately, after we shared with our “councilors” and they took it to the king/Pastor X and discussed it (note: they never said they prayed about it), they agreed that what we shared was obviously something that we were passionate about and therefore they would release us and bless us. My wife told me to be happy because we got what we hoped and prayed for. I am happy (for her. It didn’t matter to me. ), but I really feel that they are happy to see us go (and thus end my family’s 27+ yr involvement in the church). I was counseled by a former elder (The pastor in Woodstock who was a ‘sent out’ one but who later was “divorced” by the pastor.) that they just want us gone (in the same way Pastor X wanted him gone, so they ‘sent him out’ [since kicking out an elder for no apparent wrong leads to church splits]), so I’m rather skeptical of the whole thing. But whatever, they said they would bless us out, so in the spring, after our home sells and my son’s school work is done, we will be gone (yeah!). Wow, if that doesn't qualify for "bittersweet", I don't know what would! And I agree, being "blessed out" under the terms you listed is better for your extended family, but please keep in touch once you've been "blessed to leave". I may be wrong (and hope that I am), but "detox" may become much more a reality for you at that time. The comment box is always open here, and you can always email me from the link at top right as well, if need be. It's quite possible "detox" will become much more of a reality at that time (although I too hope your wrong ;) ), thank you for your kind offer of support. I'll probably take you up on it. I do have to say, for anyone reading this post, that I don't (anymore) harbour bitterness toward the church leadership (I couldn't have said that 6 months ago). And I don't think that they are the spawn of Satan (ha, ha, I was going to call them horny little devils but realized that it wouldn't sound right). These men (& their spouses) are good people who, because they are charactered and principled (although I have reservations that Pastor X is charactered), are just being true to the doctrine & theology they know (as layed out by ONE man - Pastor X). The biggest thing I can't agree with are their beliefs, their actions are just a reflection of those beliefs. With this group, their beliefs are far more hazardous than their methods. I'm English, have been living in Germany the last 16+ years, where I've been serving in a free ev. church. Over the last two years the Lord has been opening my eyes to everything that has been discussed here. Both my husband and I have been experiencing the paradigm shift, guilt, fear, beginnings of detox (presumably) as we felt the force of leadership saying we were rebellious, church splitters, dangerous, etc. Leadership folks have been some of our best friends. The real change in our relationships has been painful. I am struggling with a sense of aloneness, loss of identity and motivation; I look for escape in TV or films, books and the internet and am wondering if this is common? I feel as if I don't know who I am any more - as if my whole Christian life, for the last 23 years has been so taken up with church, that apart from church, I don't know who I am, what I like; I only know that the Lord has opened my eyes. I'm also reevaluating everything I've been taught in my years as a Christian in terms of how to follow the Lord - what was really from the Lord and what was just rules and legalistic stuff. I love Jesus and am afraid that I might drop off the path of following Him simply because the 'mental support' structure of church is no longer there in my mind. The physical support structure was there in a way, although it was more often than not, somewhat superficial; relationships were based more on ministry - if you were no longer in ministry in a given area, and we were in many, then relationships broke down. If you weren't 'in leadership' anymore, then, guess what? your relationships with those you thought were your friends who remained in leadership, changed. They didn't have time for you. It wasn't necessarily intended like that; it was just inevitable. Take the Best and Go!